Home / Book Blitz / FBQ / Free-Bargain Books / Njkinny Tours & Promotions / Huge Kindle Books Sale on Amazon India for 2 Bestsellers by Ellie Campbell ~July Only! Huge Kindle Books Sale on Amazon India for 2 Bestsellers by Ellie Campbell ~July Only! July is such an amazing month. The Monsoons are here and just like the rain shower, there are also books getting showered in this month. 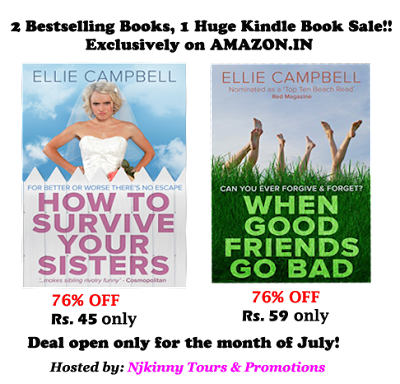 Ellie Campbell's 2 Bestselling and simply amazing books, How To Survive Your Sisters and When Good Friends Go Bad are on HUGE SALE on Amazon India. I can't recommend this author's books enough, they are so good. Readers in India, this is a must-avail chance to get to know this very talented author and read her books at almost free rates. PS: The Deal is for the Kindle version of these stories. 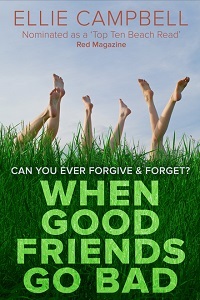 All through school tomboy Jen, snobby Georgina, hippy Meg and gentle Rowan were inseparable. But when a childish prank turned bad their friendship was torn apart. 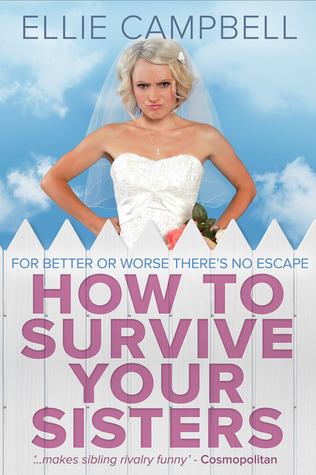 Until now, when in the midst of her divorce Jen receives a desperate call from Meg. On a personal mission to track down Rowan, Meg manages to convince Georgina and Jen to put aside their differences and help her. But none of them even begin to imagine the extent to which their loyalties will be tested as their past finally catches up with them. The book was nominated as a "Top Ten Beach Read" by Red Magazine.